I should start by saying that I have never been much of a cyclist - I had my obligatory umpteen-speed MTB as a teenager that went to university with me and was used infrequently. It followed me around and my partner used it a bit, but now it sits in the garage completely unused. 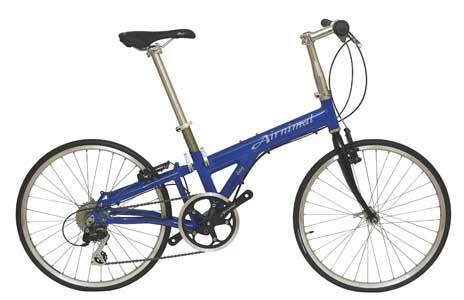 In reality I had not cycled in a meaninful way for 7-8 years when in September 2006 I purchased an Airnimal Joey Sport. Last summer I decided that after nearly 3 years commuting I could probably find a better way, and looked to getting a bike with the intention of reducing my car use by 80%, swapping my 12 mile drive for the train (Chippenham to Bath) and a 3 mile ride, hoped to be along the canal towpath. I was fortunate enough to work in Bath, and so I have Avon Valley Cyclery and John's Cycles in the city available, and after much deliberation (my other half will attest to the pain of living with someone who can only make a decision after weeks, if not months of thought) I went with an Airnimal Joey Sport, purchased under the government cycle scheme. I chose the Joey largely in prefence to the larger Dahon Cadenza, having decided that I didn't fancy joining the significant ranks of Brompton owners in my office. I also harboured a delusion that I might use it for slightly longer runs fairly regularly, and wanted something that would be comfortable, stable and quick. 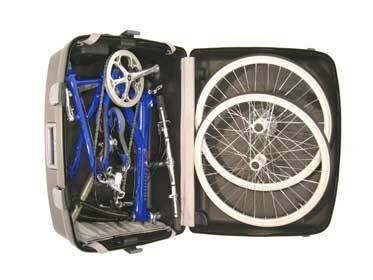 My main concern with looking for a larger folder was its suitablility for use on mainline train routes, and I found I couldn't help but worry about how well the Cadenza would go down on a packed daily commuter train. I considered that the Joey would draw less attention, and was also a piece of engineering designed around how it folded, whereas the Cadenza felt more like a full-size bike that is able to fold. I got good advice from websites and notice boards, most notably the CTC forums. At the same time as buying the bike I also added lights, folding pedals, correct sized SKS Race Blade quick release mudguards, a Carradice soft carrying bag and a couple of spare inner tubes to the cycle scheme bundle. It made it a pretty hefty price, but I figured it would be worth it, and the more I spent the more I would save in tax! I already had access to an aged helmet, a base layer of sorts. once the weather turned a bit I quickly got a reflective jacket, windproof, gloves, and all that palava. My first impressions of the bike were that I was right about the nature of it being 'engineered to fold', and it gave a good rush of adrenaline every time I got on the pedals. I found myself deliberately getting stuck in off red lights and on any vaguely downhill stretch, keen to see what it could do. It is hugely fun and immeasurably a better bike that I am a cyclist, which gives me confidence to push myself harder round the corners or work it up the gradients and back down. It is a very rigid package, especially if the Kenda Koncept tyres are at 90psi, and so I don't use the canal path as I had expected, as it is far too uneven. The main Bath road (A4) is better surfaced and comfortable on the backside. I have found a new world of transport open up to me - I've used it with the train and car to link up places, combining short runs with public transport to get around. I managed to surprise my partner on our anniversary - cycling from a local station to her office and putting the bike in her car after. For a period I cycled once a week 7 miles to a nearby swimming pool, sadly curtailed by the facility being closed down in March 2007. I have found this a great loss - it is only on the slightly longer runs that the bike comes into its own, and I really get a sense of how much enjoyment can be had on two wheels. The longest ride I have done with it was from Clifton in Bristol to Chippenham on a Sunday afternoon in December. I had intended to take the train at Bath, but found the rail system in chaos when I arrived from the Sustrans route into Bath. Even after being in the saddle for 90 minutes, the thought of taking the Airnimal up Box Hill seemed like more of an intruiging challenge than a worry! I got rid of my car in the spring, as much because I enjoyed the cycle to work as because it needed an expensive repair. Airnimal Designs have recently released a handlebar and wheel strap which allows the bike to become a single package when folded. It really is excellent as far as the handlebars go, but I still prefer to carry the front wheel as adding it to the package makes it a bit unweildy. On the train it is just a bit too big for the luggage racks on the Intercity 125's, but there are 3-4 places you can put it that generally mean it can go somewhere at least. the newer trains and refurbished 125's are a lot less accomodating but I've never been stuck for a place to stand with it if it has come to it. Now that I have got used to cycling, the 8-speed SRAM gearing has started to feel a little low, and I may look to replace the chainring with something bigger next year. Most of all I would love it if the handlebars had a positive central stop, because it would speed up the assembly [See note below - Ed]. The Carradice carry bag has hardly been used, mainly because it is almost impossible to get the bike in the bag without swearing, the chain letting go, the brakes or gears getting fouled up and the lights getting knocked on. I had thought iIwould use the bag on the commute but it is impractical to the point of lunacy. 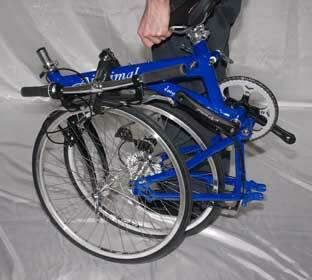 [It is also quite bulky to carry when not enclosing the bike - Ed]. The Race Blade mudguards are a daily gamble - a choice between the extra hassle they add to the fold or the risk of getting spray up my back. As long as the weather improves in July and August, I'll be happy. All in all I have had a very pleasant 9 months with the Joey. It has provided me with some very pleasurable days out, and I still look forward to using it every day. I get the occasional comment on the train, mainly about how interesting it appears. A few times I have considered the direct route to work (12 miles on the A4) but can't quite muster the courage to face the traffic speeds - I used to drive them myself and have seen what kind of idiots frequent these stretches of tarmac. If the weather improves over the summer holiday period I might consider it. My other half generally has to try to disuade me from finding a way of using it in trips we are taking, as I will happily add complication to the journey so that I can use it. All I need to do now is find a suitable child-seat as we are about to have our first child! Our thanks to Airnimal Designs for the photographs - Ed.